All transactions are safe and secure with a reliable history in online purchasing behind each of our associates. Buy the Miami Ink Honor t-shirt to own Miami Ink clothing and merchandise. This cool addition to our selection of Miami Ink merchandise features a design that includes the Chinese markings for "honor" on the front, printed vertically in black ink. The back of this yellow tee displays a design that includes the Miami Ink TV show logo, along with the word "HONOR" printed underneath the logo. 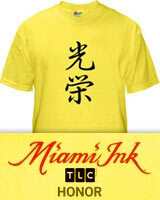 Don't be shy to wear this Miami Ink clothing item everyday, just like you would a real tattoo. Look for this tee in a variety of styles and colors, including light grey and natural. In addition to the Miami Ink Honor tee above, browse the Miami Ink Clothing Gallery for more apparel like men's and women's clothes, kids shirts or hoodies.